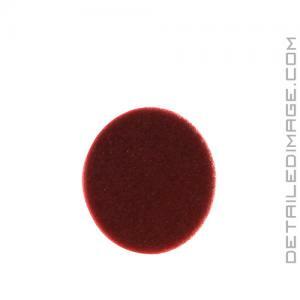 The Buff and Shine Uro-Tec Maroon Medium Cutting Foam Pad will help you remove anything from light to heavy imperfections from your paintwork. Pair this pad a medium to heavy cutting polish for moderate corrective solution. This pad is extremely versatile and can remove swirl marks, water spots, oxidation and other unsightly imperfections in only a few effortless passes. With the rise of the long throw polishers, imperfections are being removed faster than before. This long throw design and overall polishing speed saves detailers valuable time, however, it increases polishing heat and can really do a number on polishing pads. Buff and Shine imported high-end specialty European foam, that is designed for use with these long throw units. The foam is made with high-quality reticulated (open cell) euro foam of a higher density than traditional foam pads. This open cell structure and center hole helps disperse heat and reduce pad softening during use. The foam is attached to the backing with premium heat resistant adhesives, which only adds to the overall durability of these fantastic pads. Add the versatile Buff and Shine Uro-Tec Maroon Medium Cutting Foam Pad to your pad collection today! Beveled Design: Working area is actually 1" larger in diameter than the backing. 1" Thickness: Balance between stiffness, consistent contact across the pad face, and flexibility/maneuver into body contours. My initial impressions of the Uro-Tec product line is that it seems like a great set of pads, and I really enjoyed using them. They remind me quite a bit of the Rupes foam pads which I had really grown to like in the past, especially the yellow polishing pads and white finishing pads. While the majority of my pad collection still consists of the traditional foam "flat pads", I anticipate purchasing more of the newly designed pads such as the ones found in the Uro-Tech line moving forward. Sorry, there are no reviews yet. Be the first one to write a review! Thank you very much! The site is perfect with every detail.